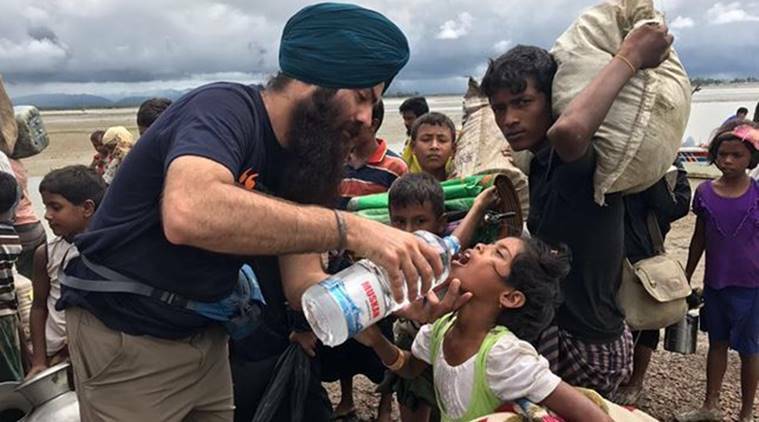 Rohingya refugees escaping violent persecution and crossing the border from Myanmar to Bangladesh are being met by Sikh volunteers providing free food, water, and shelter. So are Syrian and Iraqi refugees, many of whom are abandoning their war-torn countries by foot and encountering free bakeries set up and operated by Sikhs. 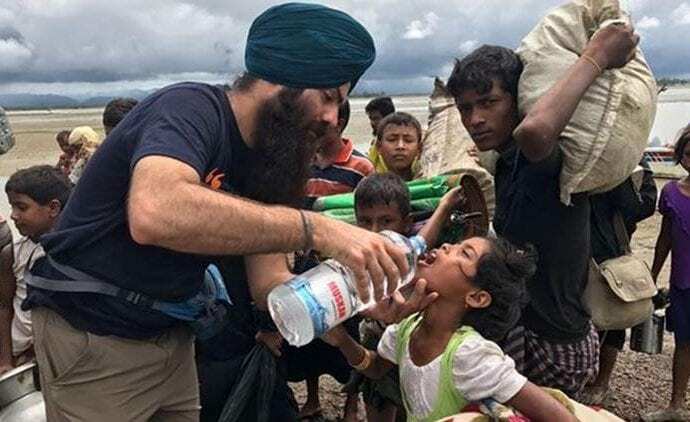 Despite only making up a small percentage of the global population, Sikhs continue to serve at the forefront of humanitarian crises, from hurricanes and tsunamis to floods and terrorist attacks. Why is this the case? Their altruism comes from the tradition of seva, a practice of justice work that is at the very core of the Sikh tradition. This piece will explain and explore how seva is articulated and formulated in Sikh teachings, how Sikhs use it to conceptualize justice and activism, and the ways we can witness seva in the world today. The numeral 1 is the first character in the Guru Granth Sahib (the Sikh scripture), and it is the cornerstone of Sikhi (the Sikh religious tradition). 1 points to the oneness of the world, the connectedness of reality, the intermingling of creator and creation. The opening numeral is tied to another character, oankar, and together, the characters form 1 oankar, referring to a single divine force. This logic leads to a concept of divinity that connects all that exists. The Sikh view is that divinity permeates every aspect of our world. Perhaps the most relatable way of understanding this concept is to think on an atomic level: if everything we know is composed of atoms, then think of each atom as being infused with divinity. In the Sikh worldview, all is divine and pure. Nothing is inherently profane or evil. The logic of this outlook is clearly expressed in a scriptural composition by Bhagat Kabir, a renowned devotional poet of early modern North India. First Allah created the light and all the people of the world. If the whole world is born from the one light, then who is good or bad? The creator is in the creation, the creation is in the creator – deeply embedded in all space. The vision of divine interconnectedness extends to a view of all people as divine. There is no such concept as original sin, nor is there any space for social discrimination based on notions of purity. The idea of divine presence is central to the Sikh principle of absolute equality. The goal of Sikh life is to go beyond any egocentric way of seeing the world and to realize the oneness of the world. Sikh teachings refer to this state of realization with many words, including simran (remembrance), anand (bliss), and sahaj (equipoise). Sikh teachings describe this realization as a form of deep love that is joyful, self-effacing, and all-consuming. I don’t want power, and I don’t desire salvation. All I want is to be in love at your lotus-feet. A Sikh aims to live with love through a daily practice of experiencing love and oneness within one’s own life. Oneness and love are the two building blocks of Sikh living. Seeing the world as divine informs the ways that Sikhs aim to interact with the world. One can honor the creator by honoring the creation. One can serve Vahiguru by serving those around them. The two are one in the same. Service, for Sikhs, becomes a way to express love. Service is prayerful action. Service is worship manifest. As I already mentioned, the Sikh tradition has a specific term for this work, seva. Except, Sikhs will say that “service” and “activism” are not adequate translations of that term because they fail to sufficiently capture the logic and spirit underlying it. Thus, Sikhs have generally translated seva into English as “selfless service,” which does a better job of articulating the distinction between activism and seva. At the risk of being overly simplistic, let me put it like this: activism is about the action itself, whereas seva takes into account the motivation as well as the action. In the Sikh tradition, it’s not the action alone that constitutes seva – the intention is just as important. True service is motivated by love. What kind of a servant is that in which fear of the master does not dissipate? O Nanak, the real servant is the one who always remains connected with the master. Serving with love is not just about eliminating fear. It is also about eliminating the sense of self. This is what Sikhs mean when they describe seva as selfless service. It ties directly to the idea of realizing divine oneness by effacing human ego. To truly serve with love is to not see a distinction between the self and the other. If a servant performs service with ego and anger and excessive speech, the master will not be happy. If one performs seva while removing the sense of self, the honor is obtained. O Nanak: One who serves with love receives honor and is truly accepted. The tension here, of course, is that this love is not just about loving the other. It is also about loving the self. So how can we define service as selfless when it is also, in a way, self-serving? Sikhs answer that question by flipping its attendant assumption – when one sees the world through a lens of interconnectedness, then what is the difference between the self and the other? When one sees no difference between the self and the other, it becomes crystal-clear that our experiences are interconnected. And if my liberation is tied to your liberation, and if your suffering is tied to my suffering, then the only way forward is through loving, selfless service – or seva. The Sikh idea of seva, then, brings together the realms of spirituality and justice. This concept is so central to the tradition that Sikhi coined its own terms to articulate this worldview. For example, some of the first vocabulary words I learned as a child included seva-simran (service-remembrance), miri-piri (political-spiritual), sant-sipahi (saint-soldier). Every Sikh is expected to live in a way that holds together these seemingly disparate aspects of life; every Sikh is expected to cultivate their own spirituality while also serving the communities around them. As with all ideologies, this worldview sounds theoretically sensible but one might want to ask “Is it achievable? How does it play itself out in the real world?” Like many other religious communities, Sikhs look to the lives of their prophets to see how these ideas manifested themselves by exemplars of their faith. This memory of Guru Nanak as a young boy continues to be invoked by Sikhs to share the importance of charitable giving and of recognizing one’s own privilege. And the term Guru Nanak is purported to have used – sacha sauda – remains a common term in Sikh vocabulary to refer to a form of generosity tied to a feeling of connectedness and love. Another example central to Sikh memory comes from the life of the ninth guru, Guru Tegh Bahadur (d. 1675 CE). According to Sikh traditions, Hindu hill rajas came to seek his help when they were being persecuted by the Mughal state, which at the time was under the leadership of Aurangzeb (d. 1707). Sikhs were not, themselves, being oppressed, but Guru Tegh Bahadur recognized the persecuted Hindus as siblings in humanity. He protested the state’s attacks on Hindus, and for his troubles he and other Sikh disciples were detained, executed, and tortured. Sikhs remember Guru Tegh Bahadur’s death as a form of martyrdom, in which he gave up his life defending the Sikh ideals of religious freedom and the elevation of all humanity (sarbatt da bhalla). These ideals are built upon the cornerstone of love and oneness. One who neither fears anyone nor causes anyone else to feel fear – Nanak says, o listen my heart-mind, recognize this person as wise. For Guru Tegh Bahadur, a divine life has no space for fear, particularly because it causes one to see division rather than oneness. A true servant, as we said before, is one who is motivated by love. I frequently reflect on these models and others like them as a way to shape and guide my own justice work. I try to ground my own activism within the core ideals of oneness and love, and I do what I can to practice other Sikh principles that emerge from them – like fearlessness and standing up for the oppressed. Perhaps the most obvious example of this has to do with my work in confronting racism and Islamophobia. I continually stand up for Muslims based on the hate they receive despite the negative consequences I have endured for doing so. While it might be easier to redirect the anti-Muslim hate I encounter towards our Muslim sisters and brothers, I – and many other Sikhs I know – have made the choice to stand with them, despite possible harms, because we believe it’s the right thing to do. This response is not necessarily a natural or intuitive one. Rather, it is a purposeful decision that Sikhs around the world have made on the basis of our principles and the examples set by our gurus. How can I justify not working for the equal treatment for those who are oppressed and marginalized when Guru Tegh Bahadur ultimately gave his life to ensure equal rights for all? And as we learned in the example of Guru Nanak above, what better business is there than serving those who need it most? In a context where we are interrogating the inequities embedded within our own systems, it seems prudent that we keep in mind how the Sikh gurus imagined the world and created structures that helped enact these values while challenging existing inequities. In understanding the Sikh model of justice – seva – through the lens of Sikh traditions we arrive at a better understanding of the Sikh worldview, one in which service emerges as a natural expression of oneness and love. This is a critical point for knowing who Sikhs are and why they act the way they do. Moreover, the logic that underlies the beautiful spirit of seva is not owned by Sikhs alone. Any Sikh would tell you that they believe that these ideas are universal; Sikhi does not lay any exclusive claim to this worldview they welcome others to take freely from it. I draw another important lesson from the lives of the gurus that informs my own activism today. The gurus were not shy about social and political critique, particularly when it was focused on issues related to discrimination and inequities. Rather than simply pointing the finger and simply criticizing everything they encountered (as we are often inclined to do), they followed up their critiques by offering practical solutions that empowered the marginalized. They rejected poverty and caste hierarchies and established the institution of langar, where all people would sit together as equals and be served food. They eradicated last names, and instead gave collective surnames – Kaur for women, Singh for men – that reflected a shared familyhood. These names were drawn from traditional royal names in South Asia, and also indicated to each individual that they were powerful and sovereign. The Sikhs gurus were builders. The spirit of oneness and love infused their seva – and this enabled them to build institutions beyond divisions, hierarchies, and supremacies. And this is where the difference between seva and activism becomes significant. I believe that in order to build a more just society, we must build our structures upon the foundation of oneness and love. Seva is about the ethic as much as it is about the action; the inspiration and intention matters just as much as the act itself. Therefore the model of seva helps ensure that we are not simply creating new movements or institutions that carry the same fissures and cracks that we see so clearly today. The notion of oneness allows us to celebrate diversity while being inclusive and intersectional. 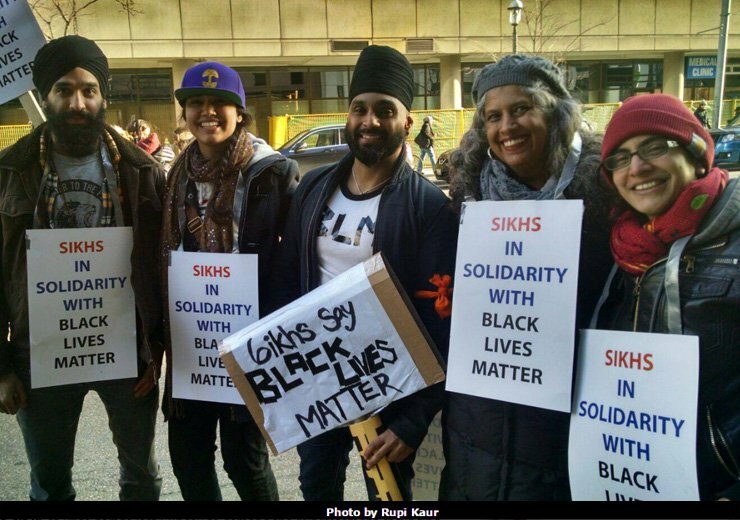 To see our own lives as intersecting and being bound up with people we do not know and may never meet – this is what compels Sikhs to do what’s right, whether it is rallying for racial justice or creating community food banks. It is in this spirit of authentic generosity that seva has become the signature of Sikhs all over the world. The Sikh volunteers have continued this work, despite the fact that some of the refugees they are serving have mistaken them for members of the Islamic State. While the Guru Granth Sahib was compiled by the Sikh gurus, it is not exclusively comprised of their writings. The scripture is an anthology that includes writings from more then a dozen other spiritual figures of diverse backgrounds.